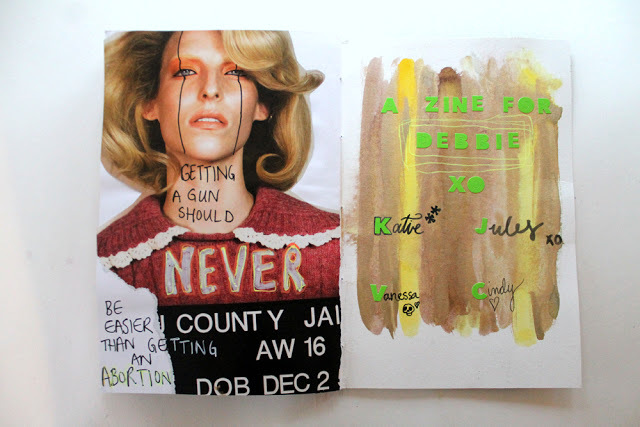 The Zine Squad enlisted Cindy and we zined Debbie! Julia had wanted for a long time to do a zine on women’s health and Debbie was the perfect recipient for it. And since Debbie and Cindy get along so well, this came together really nicely. 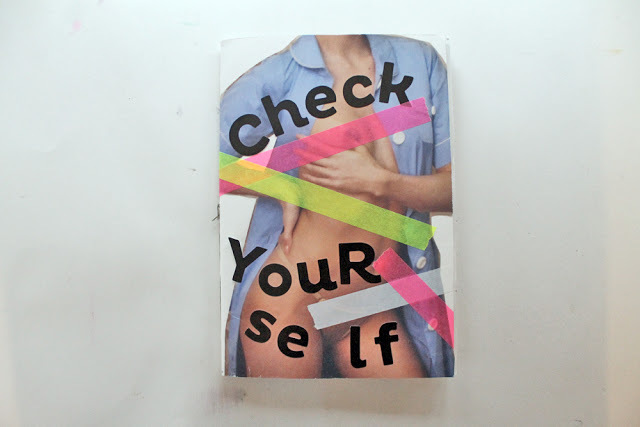 The theme was women’s health and so I did the page on the left based on breast self-examination. The paper I used is filled with drawings of sewing notions and such. I wrote “women’s work” because I feel that term has been used to much to dismiss women’s issues as hysterics or nervous ailments when there is much more there. I would like to see a shift in that expression’s meaning. My double spread is all about choice and the necessity of having comprehensive health care available to women of all ages and in all situatons wherever they live. No matter what they decide, all possible services should be available to all women. And finally, I did the page on the left here because I am definitley anti-gun and I can’t even fathom that it is so easy to get one in certain areas of the US whereas getting an abortion, which is a right just like owning a damn gun is, is super complicated and policed. That makes me angry. Please check out everyone’s pages: Julia, Katie, Cindy and Debbie.